Since the juvenile class of 2018 began racing in April, OBS graduates have made their presence felt from coast to coast, with 50 OBS graduates leaving the maiden ranks in special weight company. Racing’s spotlight now shifts to Saratoga, where the accent is always on 2-year-old racing, and the most promising newcomers are often unveiled. 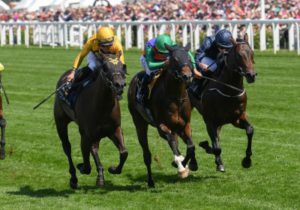 A trio of OBS graduates will go in Friday’s six furlong $150,000 Schuylerville Stakes (G3) on opening day at Saratoga. Trainer Mark Casse sends out John C. Oxley’s Catherinethegreat and Gary Barber’s Eyeinthesky, joined by Charles L. Biggs’ Congrats Gal, saddled by Cathal Lynch. 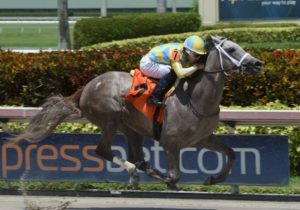 Catherinethegreat comes into the Schuylerville off a 10-1/4 length romp in a five furlong maiden special weight dash at Gulfstream on June 22nd. 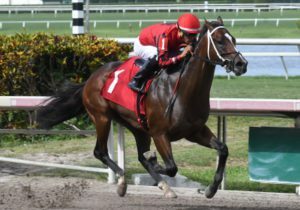 The daughter of Uncaptured, who also raced in Mr. Oxleys’ colors, topped the 2017 OBS October Open Sale of Yearlings, purchased for $170,000 out of the Turtle Pond Farm consignment. Three graduates of the 2018 OBS March sale debut in a 5-1/2 furlong $85,000 maiden special dash on Saratoga’s opening day card. 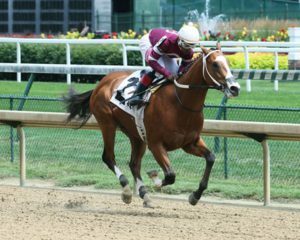 The boys swing into action at Saratoga on Saturday, with a pair of OBS grads in the six furlong $150,000 Sanford Stakes (G3). The Saturday card’s 5-1/2 furlong $85,000 maiden special test drew three youngsters from March and three from April. The OBS class of 2018 made a big impact in the early summer racing in the Midwest.